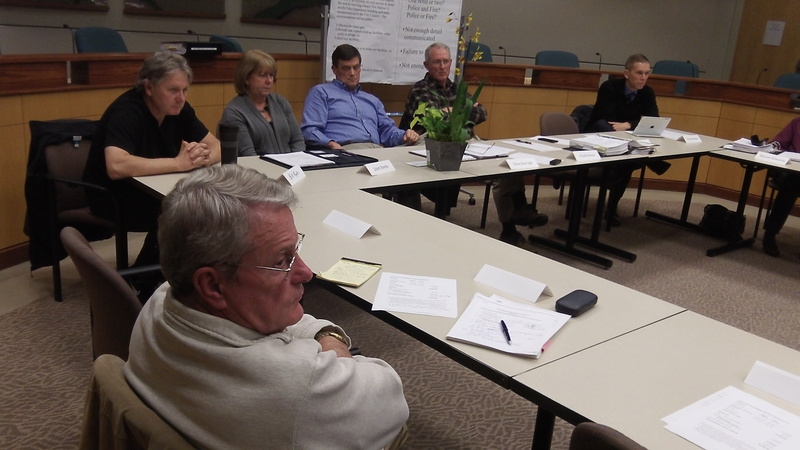 Among the panel members present Thursday, from front: Tom Cordier, Bill Ryals, Janet Steele, Dave Burright, Frank Morse, Chris Norman. If the city council goes along with the recommendation of a panel of citizens, and it almost certainly will, Albany voters next May will decide on an $18 million bond issue to pay for a new police headquarters and downtown fire station. The amount is $2.3 million less than the proposal voters rejected in 2013. During its final meeting Thursday night, a special committee named in response to the bond defeat recommended the lower sum. Headed by former state Sen. Frank Morse and retired Linn County Sheriff Dave Burright, the panel spent much of last winter and spring reviewing the need for both buildings and diving deep into the details and recommending a design competition, now concluded. The committee accepted — and will recommend to the council in December — an outline showing total costs of both projects as 24.4 million. Some $1.4 million would be paid by CARA, the downtown urban renewal program, and the city would contribute about $5 million from its Pepsi settlement. The group agreed with member Tom Cordier that its recommendation to the council should include a call for CARA to contribute as much as it can to parts of the projects. At the urging of member Janet Steele of the Albany Area Chamber of Commerce, the panel also recommended that $2.4 million of the settlement money, now designated for economic development, would be restored to that purpose in the Pepsi fund when money is returned to that fund from other sources. Cordier raised the question of proposing separate bond issues, one for each building, but most other members preferred to stick with one. So the council will now belly up to the buffet of available public monies (at least $20M) and decide how much to gorge on pet projects and how much to throw at public safety buildings. And if the council follows this committees recommendation, a bone of $2M will be thrown at the latter. At the same time the council will demand that property taxpayers restock the buffet with $18M. The council gets their cake and eat it too. The taxpayers get table droppings.